ActivityInfo’s team was very excited and proud to host our first user conference in Geneva on the 15th of June 2017. We have chosen Geneva as this is a human rights and humanitarian hub which is home to the European headquarters of the United Nations and some other 250 NGOs. 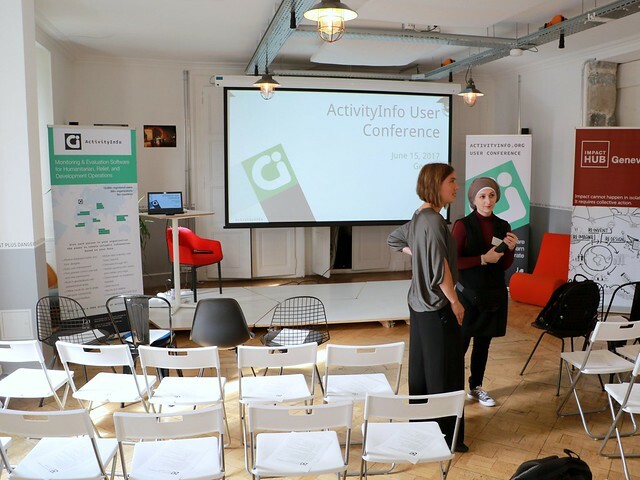 One of our main goals of our user conference was to give an opportunity to all our users and future users to connect with other humanitarian professionals, share their experiences with the tool and learn how some organisations have been using ActivityInfo to improve their crisis response. Beside, we found it was important to explain where ActivityInfo is heading in the future with the deployment of new features but also with the creation of an Advisory Board and a Technical Working Group. Participating to the ongoing Advisory Board or Technical Working Group is the occasion for experienced users to take an active role in shaping the future of the software. Fourteen organisations, from UN agencies to smaller NGOs, from 3 differents continents (Europe, Africa and Middle-East) participated to our user conference. During the day, they had the opportunity to talk with every member of ActivityInfo’s team and to get detailed information and tutorials about the platform. One of the highlights of the day was certainly the presentations made by UNRWA Jordan, UNICEF Lebanon and Humanitarian ID. During these presentations, we have learned how UNRWA is using ActivityInfo for GBV Case Tracking and how they are dealing with the challenges of managing highly confidential information. UNICEF Lebanon explained how they improved their reporting and decisions making by using ActivityInfo as a centralised and collaborative information management system allowing them to generate about 30 maps and reports each month. And finally, the big take away from Humanitarian ID, which is a single contact management solution for everyone working in humanitarian crises and disasters, is that users will soon be able to log in to ActivityInfo with their Humanitarian ID credentials. The user conference also coincided with the launch of our new website which has been completely revisited and redesigned. If you want to know more read our short blog about what has been changed and improved. What about the future of ActivityInfo? The purpose of the Advisory Board and Technical Working Group is to identify the overall vision of ActivityInfo, the principal use cases and the major elements that need to be developed or improved in the coming 3 years. During our first meeting we have agreed on the roadmap which amongst others includes; finding a more sophisticated ways of managing users permissions, improving the spreadsheet importer and the merger functionalities, increase the performance of the analysis tool, develop a workflow engine or enhance the user interface. This Advisory Board and Technical Working Group will be held regularly to ensure visibility on the projects the members and we are working on and to ensure the projects take into account the rapid changing reality of the field. To conclude, the day was a real success where we were delighted to finally meet our users face to face and have valuable conversations. We made sure everybody got value from the day and we are looking forward to repeat this conference in a near future. Next time to avoid administrative burden from getting all the travel documents in time, we will consider to have our next event in the Middle-East. Video recordings of the presentations and discussions are available on our video page with tag “AIConf17”. See below for pictures taken at the conference.